A concert in the St Patrick Centre in Downpatrick has helped raise vital funds for an important project in Africa. Sister Mary Delargy of the Sisters of Mercy who taught in the Convent primary school in Downpatrick in the 70’s and also in Belfast, was fundraising for a job creation business in the Mazabuka area of Zambia. 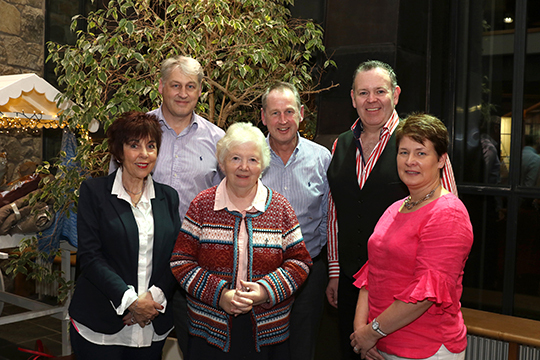 Pictured just before the concert were, back row, (l-r), Roy and Paul French of French’s Restaurant in the St Patrick Centre, and Stephen Smith, Portaferry singer, with from row, Marie Gallagher, Director at Down Travel, Sr Mary Delargy of the Sisters of Mercy, and Fiona Connolly’s of Connolly’s Store. Her plan was to raise enough funds to purchase an electric generator which would be the backbone of a car wash business supporting up to six families. Sr Mary said: “The people in Zambia are still very poor. There is only around an hour of electricity supply a day and our aim was to buy a generator running on petrol to help get six unemployed Africans into work. 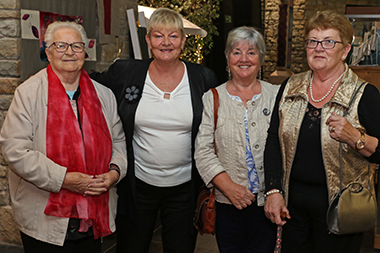 Anne Quinn, Anne Trainor, Irene Sheridan and Monica Skillen looking forward to the concert in the St Patrick Centre. “There is very high youth unemployment in Zambia and this should go some way in making a small impact and benefitting several families. I’ve had the good fortune to have the help of local man Charles Mwanda. He has been a great link with the local people and he would translate for me and travel into the bush to meet local villages and people etc. We are also helping him build a home and the fundraising for this is ongoing through Belfast, Derry and Downpatrick. “Over recent years, other sister have built two schools, a woman’s centre, a centre for the disabled, and a pre-school, and they have run programmes for adult literacy. My project is just one of several that have been completed or are in the pipeline. “At the moment I am trying to help two graduates who despite qualifying cannot find work. The sort of opportunities that exist are working unpaid for three months then for another three months at £120 a month, then they are laid off. It is very distressing and disheartening for these young people. They are often exploited and then cast aside back into unemployment with little prospects. “So the funds raised will help to undercut these very negative experiences that young people find themselves trapped in. 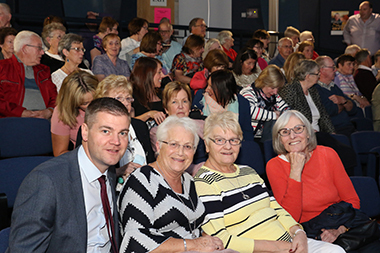 A section of the audience at the fundraising concert in the St Patrick Centre for Sr Mary Delargy. 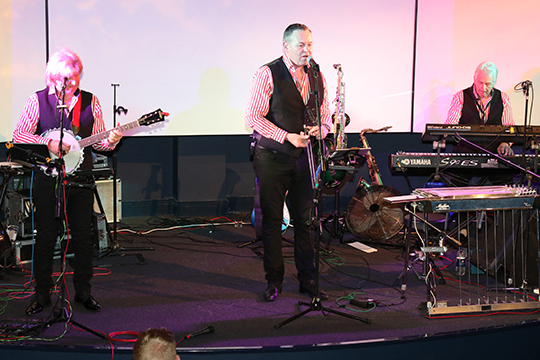 The main stars at the concert last Thursday evening were Stephen Smith and his band. 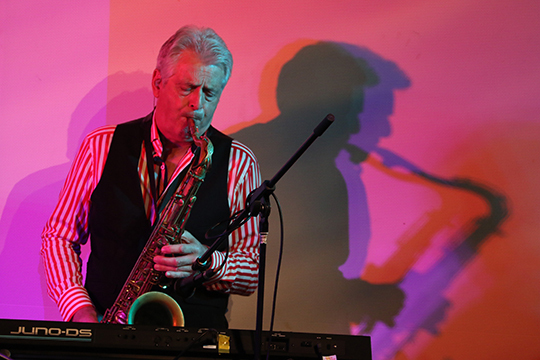 Stephen is from Portaferry and is a well known local entertainer with his own brand of Irish country music backed up with a mix of Joe Dolan numbers and a saxaphone medley that got the room rocking with a Glen Miller selection. The audience also enjoyed a light supper during the interval prepared by French’s restaurant now managing the restaurant in the St Patrick Centre. Stephen Smith, centre, with this band entertained the audience in the St Patrick Centre during a fundraising evening for Sr Mary Delargy. A hot number of the saxaphone got the audience foot tapping. 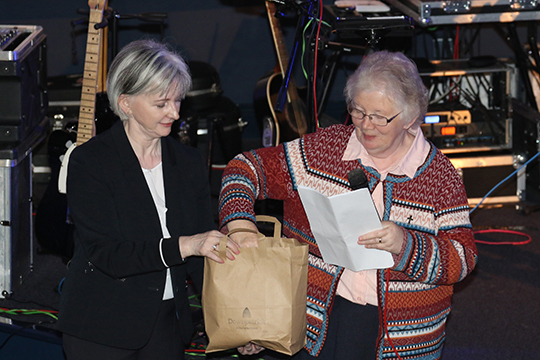 Sr Mary, right, draws out the winning tickets for the raffle with help from Mairin McGrady.